This site’s impoundments provide important resting and feeding areas for thousands of waterfowl, wading birds and shorebirds, especially in winter. Over 230 species of birds have been recorded. Pick up a map at the entrance, and explore the multi-use dike trails around a series of pools looking and listening for Limpkins, Sandhill Cranes and King Rails; American Bitterns occur in winter and flocks of Glossy Ibis are often present. A viewing tower constructed by West Volusia Audubon is located at the intersection of the three pools. Bring a spotting scope to scan the pools, and to watch the tree line for raptors. The Myacca Interpretive Hiking Trail near the entrance, the short Hammock Nature Trail at the southwest corner of pool #1, and the short Live Oak Trail at the last parking lot offer hammocks and mixed forest good for songbirds year round. Lake Woodruff hosts the second largest pre-migration roost of Swallow-tailed Kites in the southeastern U.S. Up to 500 kites congregate here from late July through early August, foraging in preparation for their 5,000- mile journey to their wintering grounds in Brazil. Refuge staff and the local Audubon chapter offer nature programs and, once a year, a driving tour of the dikes. Call ahead for details. 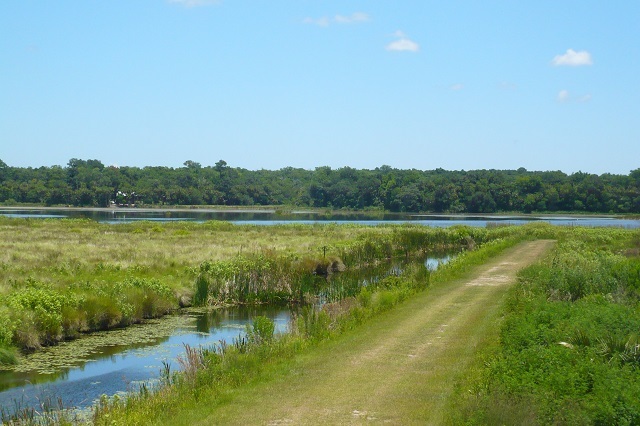 Launch your canoe or kayak at De Leon Springs State Park and paddle into the refuge. Seasonal hunting occurs on select dates at the refuge; please click here for more information.